Kolkata: The story of three engineering students—3 Idiots had established Bollywood actor Aamir Khan in People’s Republic of China (PRC), and a story which narrates the tale of woman empowerment– Dangal has made Khan, the biggest ever box office income earner in the world second largest economy. 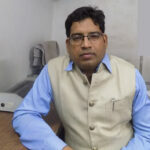 “I had liked his 3 Idiots very much and watched that movie twice. This time the story of girls how they overcome their challenges to win medals for their country was main USP of the movie and I enjoyed watching how they trained hard to achieve their goals in life,” Eric Lin, a native of Taiwan, who works in China told eNewsroom. “The scene in which the girls have to choose between marriage and career, moved me. It was different movie from other Bollywood movies, as it had little distractions like the regular, songs and dance,” added Eric. Chinese social media sites are having full of praise, for the biographical sports drama Dangal and Aamir Khan. The movie tells the story of a father, Mahavir Phogat, a wrestler, who had four daughters. Mahavir, train all her daughters into wrestling. Among them, Geeta Phogat and Babita Phogat won Gold and Silver medals respectively in Commonwealth Games in 2010. Actor Fatima Sana Shaikh and Sanya Malhotra essayed the role of grown up Geeta and Babita. “I haven’t seen such a movie that excited me. The movie is full of power, and it made me laugh and cry. The movie shows us father’s love, the dream and the encouragement of overcoming all difficulties,” a Weibo user posted in Chinese. China permits only four Indian movies to be released in the country, while it allows 38 Hollywood movies. Dangal was released on May 5, 2017 in 9000 screens across China. It has earned whopping 1.279 billion yuan ( Rs1200 crores) in PRC, which means Aamir’s blockbuster broke the Box Office record of Chinese movie Lost in Thailand, and now standing at the 16th position among the highest earned 50 movies of all time in China. Dangal now stood just behind the Hollywood movie Avatar. Lost in Thailand had earned 1.272 billion yuan while Avatar had 1.340 billion. 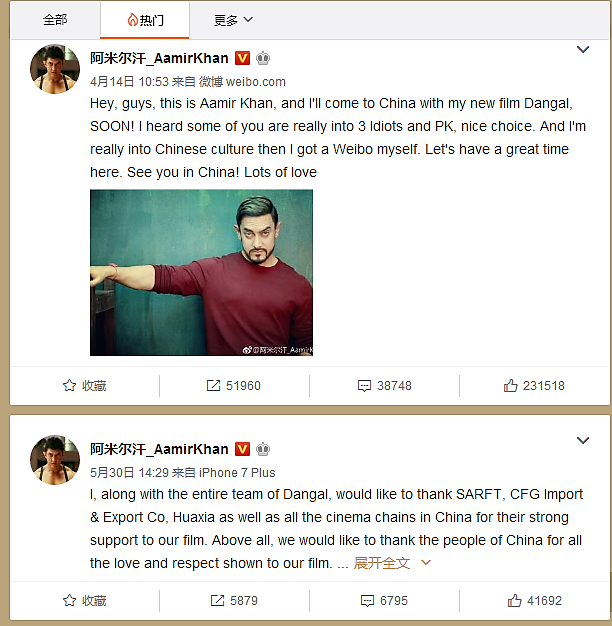 Aamir Khan, who has a Weibo account has thanked people of Chinese for their love and support to Dangal movie. The discussion about Dangal on social media site, Sino-Weibo is also dominating all topics, it has 5429 followers, and astonishingly 460 Million people have read it. And on Friday 35000 people were discussing about it. Most people are in awe with the dedication of Aamir, the Mr Perfectionist of Bollywood. Some also thanked Khan, for always touching on social issues and enlightening people. In fact, even the President of PRC, Xi Jinping has watched Dangal and according to a report, he even told Indian Prime Minister Narendra Modi that how much he liked the movie. Chinese people affectionately call the 52-year-old actor as, Uncle Aamir! The movie, even after 47 days, is still pulling Chinese crowd. “Because of having a very hectic work schedule, I could not watch Dangal, but this weekend, we will sure watch it,” added Anne Pan. So is Ren Wen, “I had watched 3 Idiots many years back and will soon watch Dangal.” And the list is long. What Xi wants, for himself and for China?